I strongly believe that kids should be kids. They should have the opportunity to run, play, create and explore. We, as parents need to encourage them to expand their imaginations - even if that means turning our living room into a jungle and having the couch become a safari ride! My oldest is extremely creative - and he loves to use his imagination in play. 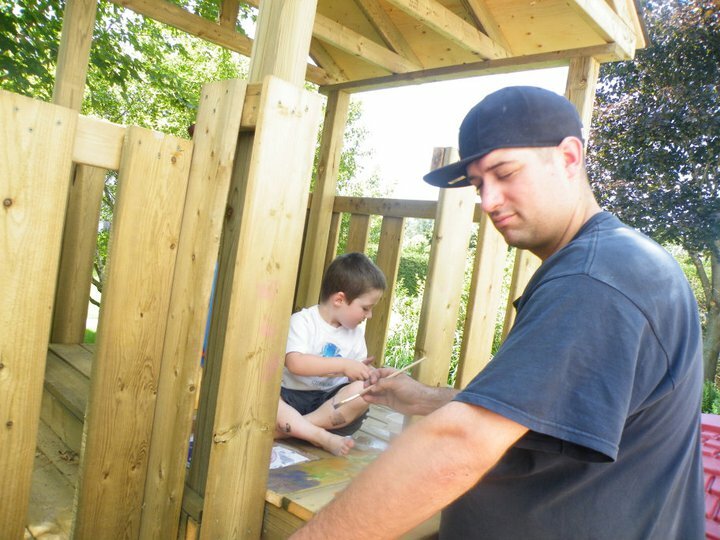 He often pulls out the craft supplies and could spend hours cutting paper, gluing shapes/letters or painting and drawing - he loves our crayola finger paints and has free reign with them on his wooden play structure out back. When we are playing in the house with toys, any that are electronic get energizer MAX batteries - they help us to get all we can out of our toys with long lasting batteries. How do you get creative? Do you explore your childs imagination with them? Energizer and Crayola truly understand the importance of creative play, and they have a great contest going on right now. From June 25, 2012 until October 1, 2012 they will be having hourly draws taking place with over 2000 prizes to be won. Visit The Energizer Bunny facebook page; give them a "like" and then enter for your chance at one of the prizes. You can also find bonus PINS on different blogs that will give you extra entries - the bonus pin for Tales of Mommyhood is "Battery"! Good luck - and don't forget to get creative with your kids and let them explore their imaginations! Disclosure – I am participating in the Energizer program by Mom Central Canada. I received compensation for my participation in this campaign. The opinions on this blog are my own. They usually cook with me or do housechores. They get pretty creative. I love that my kids enjoy cooking/baking with me too! I love seeing young imaginations at work. This is a great contest. Thanks for the PIN. no problem - thanks for visiting! So awesome! My little one is an only child and is really creative. We try to cultivate her curiosity and creativity. Encouraging young minds is so important. I completely agree. I don't feel the need to have my kids in structured activities every day of the week. I want them to have time to explore the world on their own, the way they want to and learn what they like from that.